In case you cancel your booking more then 15 days before your arrival we return 100% of prepayment.In other case we do not return the money. In case you book the place in a shorter period of time between booking and arrival, and need to cancel your booking, we do not return the money. The return of the money is conducted on your credit card during 10 working days after you send us e-mail letter with cancelation on our e-mail address. In case you refuse to check in to the room at the day of arrival to our hotel, we do not return the money. Prepayment Guests are charged an advance payment - the cost of the first night after the reservation and the remaining cost of the stay after 14:00 on the day of arrival. Going to Minsk for business or pleasure? Alone or with your family? With friends or with a group? 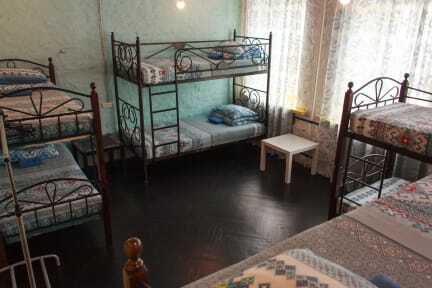 If you need a hostel in Minsk, stay at Riverside Hostel! The atmosphere is cozy and warm, you will meet lots of people from all over the world! For the convenience of our guests, the reception desk is open 24/7, we have free Wi-Fi and personal lockers. The hostel is close to the Island of Tears – just a five minute walk away – and the Niamiha metro station. Our rooms are all decorated in original ways, most of them have a river view. All the guests have access to the common kitchen that has a fridge, a microwave and a stove for your convenience. 2) Khatyn and Stalin Line. Entrance tickets and lunch are paid separately. Every day at 9 a.m.
We also organize free walking tours to help you explore Minsk city center. If you have some heavy luggage, feel exhausted, don’t want to get lost or simply enjoy comfort we can actually organize your transfer from and back to the airport. Price - 20 euros. Do you like to party? Then you’re in the right place! We are the only hostel in Minsk that organizes a pub crawl, during which we’ll show you the best and trendiest bars in Minsk. Our pub crawl is not only an opportunity to enjoy Minsk nightlife but also a great chance to meet new people. The price is 17 euros. We’ve also created amazing maps for the guests of our city, which can guide you to Minsk’s most popular tourist attractions, museums, shopping malls, bars, cafes and so on. You can explore all of it on the bikes that we offer to rent right here in our hostel. enter the gate with "love locks" on it, go into the courtyard and up the stairs to the reception. Cancellation policy: 72h advance notice. Late cancellation or no-show – one-night charge. Pay when you arrive. Both cash and via e-mail.